Since I was a kid, I've always been fascinated by the way fictional characters can have such reach and influence over us. How they can become ingrained in our lives, these people and stories made up in someone else's head. I still think fondly of some of the 'characters' that were important to me as a child: Asterix, the Hardy Boys, Hercule Poirot, Bilbo Baggins, and MacGyver, amongst others. With well-drawn and beloved characters, you can feel you know them as well as you do some of your friends. Their likes and dislikes, thoughts and quirks. Sometimes, they can also help expose you, as a reader or watcher, to things about the world you didn't yet know. I've learned about real-life people, places, causes and issues, and human interactions via the characters I've loved to follow along on their adventures. I guess that's one of the great things about reading - it can allow us to experience a lot more beyond our current life. And sometimes we later explore those things in our 'real' life too. I've travelled to places I've read about in books or seen on TV, become involved in causes, tried foods, and had many fantastic adventures that had a tiny seed somewhere in another writer's fictional character and their escapades. 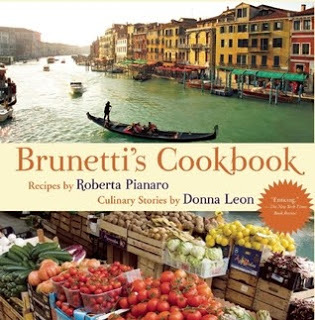 This week, my friend and fellow Ngaio Marsh Award judge Graham Beattie took a look at a new book that spans that fictional-real life crossover: BRUNETTI'S COOKBOOK, which includes tales from Commissario Brunetti's creator, Donna Leon, and Brunetti-inspired recipes from an Italian chef. The Venetian setting is a strong part of Leon's crime fiction, so I'd be interested to see how that translates into this cookbook. You can listen to Graham's thoughts on this book in a his latest segment for Radio Live here.